A singular voice for the masses. WOW! Been that long?! BUT….got news! Vampire Hunter D – A Review! The Street Fighter Saga – Memory Lane and Where We are Now! I have to state this…! With recent rumors spreading like wildfire of a potential sequel to this slightly controversial 2006 release from Rockstar Games, I felt it necessary to look back at this highly entertaining video game. 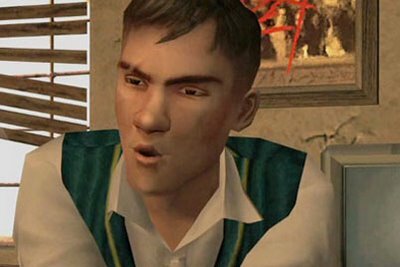 Originally released for X-BOX and Playstation 2, this game takes you into the free-roaming world of misunderstood youth Jimmy Hopkins, who came from a broken home. After being expelled from several schools and having a somewhat wild mother who’s been married numerous times, such life trials can be wearing on a young man’s psyche. Once left at the toughest school in the country, Bullworth Academy, he’s left to his own devices to figure out how to navigate the school grounds (and later, the town of Bullworth, itself), deal with the bullies, and all the other cliques. With the dubious help, at first, from Gary, and the innocent Pete Kowalski, he learns there are plenty of hidden gems to seek out in the school. Another trick you will learn is how to get the girls to like you enough to kiss you, which gets your energy level raised higher than when you first start the game. Plus, there are plenty of hidden cheat codes within the game. You utilize these by using a 2nd controller to input them. These codes include infinite weapons usage, all the weapons in the game, and raising your spending money amount, just to mention a few. And, you will be happy to know, for those who own a Playstation 3, that this game in its original PS2 style, is available now for download from the Playstation Network online. There is also an HD version of this game, released only for PC and X-BOX 360, BULLY – The Scholarship Edition, which I was not too fond of. But I did manage to grab a copy for the PC later on, which made me feel a little better. The difference for this, besides really awesome graphics, extra levels, and slightly elevated challenge of gameplay, was that I had to find a controller similar to the PS2 controller that could plug into the USB port of my computer. Then I had to get the controlling to where I was used to it. After that, it was pretty interesting playing it that way. But an added, though temporary, complication, I had to download some added programming to make it all work properly on my PC. Then it was good to go! The news of the potential sequel came around when the composer for the 1st game, Sean Lee, leaked that he was on board to do the musical composition and score for the 2nd installment. Now this news is about 5 years old, so it cannot be completely confirmed as to how long this will take to happen. With mixed reviews of the first title as well as the Scholarship Edition, who knows what will actually come of this. But we will see what happens. Content – i.e. pictures, names, etc. – are property and copyright © Rockstar Games. I don’t know what is more disappointing: that you cannot play PS2 games on the PS3 or that there won’t be a BULLY game for the PS3 or a sequel. At least, some people who have worked at GameStop stores in my area have said they’ve heard nothing of it…yet. That’s got to be one of the best video games I’ve played on the PS2! I already miss playing it, but I sold my PS2 & all the games for it for trade-in for other games on our PlayStation 3. A ‘Scholarship Edition’ had been released for the X-Box 360 not too long ago. But no plans, as of yet, had been made for the PlayStation 3. I hope they do, I would thoroughly enjoy it! Chemistry class helps you gains certain weapons like firecrackers and stink bombs, gym class helps you with self-defense moves for wrestling, and the local drunk bum behind the school teaches you more fighting moves – particularly military martial arts. Earn money, as well, running errands for students and teachers alike; as well as getting odd jobs on the outside. For those who have played other Rockstar games like my favorite “GTA: Vice City”, it is pretty much in the same vein, except you just knock out people, not kill them. Well, until it is released on the PlayStation 3, I suppose I will have to find it on the PC instead. Out of 5 stars, I give this game 4½. Rated “T” for TEEN. With rude humor, violence, mild language, and some mature suggestions, it does the trick in being something of a ‘schock-value’ game. BULLY game, name, logo, and all related material is ™ & © Rockstar games. All Rights Reserved. Want to Keep Up with this?